The Lichess Titled Arena returns with a $3,600 prize pool! In April we hosted the Lichess Titled Arena 4 tournament. 218 titled participants, including 34 GMs, played for a total prize pool of $3,200. World Champion Magnus Carlsen overtook GM Andrew Tang towards the end of the tournament to win it in dramatic fashion. For the fourth time, Magnus decided to donate his first place prize back to Lichess for the next event. 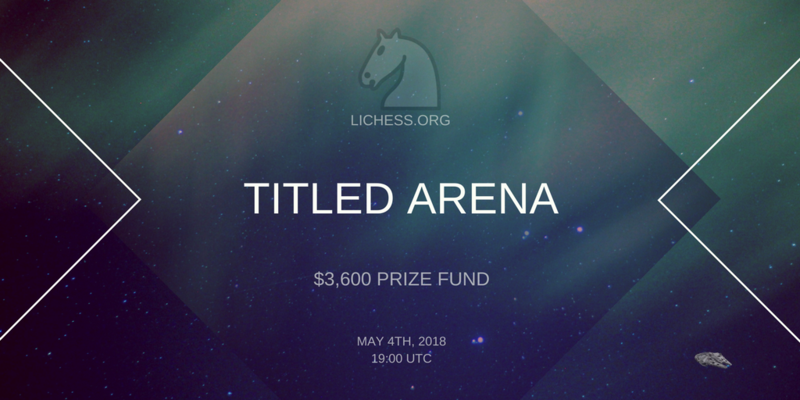 Now we are announcing Lichess Titled Arena 5, which will take place on Friday, May 4th. Thanks to Magnus's generosity, and a $350 donation from an anonymous donor, the total prize pool for this event is $3,600, including the huge $3,000 first prize. There are prizes for the top five places. A record 8,000 viewers watched a total of 19 titled players livestream the previous Lichess Titled Arena. It was an amazing community event. We hope this one will be just as exciting and engaging for participants and viewers alike. If you are new to Lichess, it's important to become familiar with the arena tournament format. Read our FAQ and consider trying out an arena tournament in advance. Arena points are awarded based on the number of games you win. If multiple players finish the tournament with the same number of points, tournament performance is used to break the tie. Prizes will be awarded within three days after the event, through PayPal. IM ChessExplained will be livestreaming official commentary for the tournament. We encourage both participants and fans to livestream the tournament. If you plan to, check out our small streamer's kit for some useful graphics to include in your overlay. Let's make this another chess event to remember!